I'm sorry I haven't been around much, here on Spokesmama. As always seems to happen, when it rains, it pours. 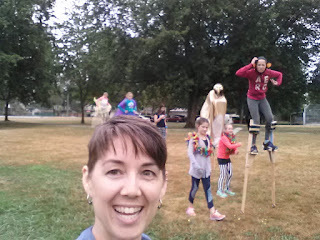 I got a gig building a class set of stilts & teaching a group of kids how to use them for CircusLab, one week before the Mount Pleasant Family Biking Festival. It's not like I haven't had time to get online, but I just haven't had the mental energy to write much. Aside from a few moments of stress when I was trying to sort out the Parks Board permit for the event & the last few hours of construction of the stilts when a couple of my essential tools were malfunctioning, being busy making things, teaching & organizing a bikey event has been so much fun. It hasn't even happened yet, but I can't wait for next year's event because I've already learned so much that will make it easier to organize. 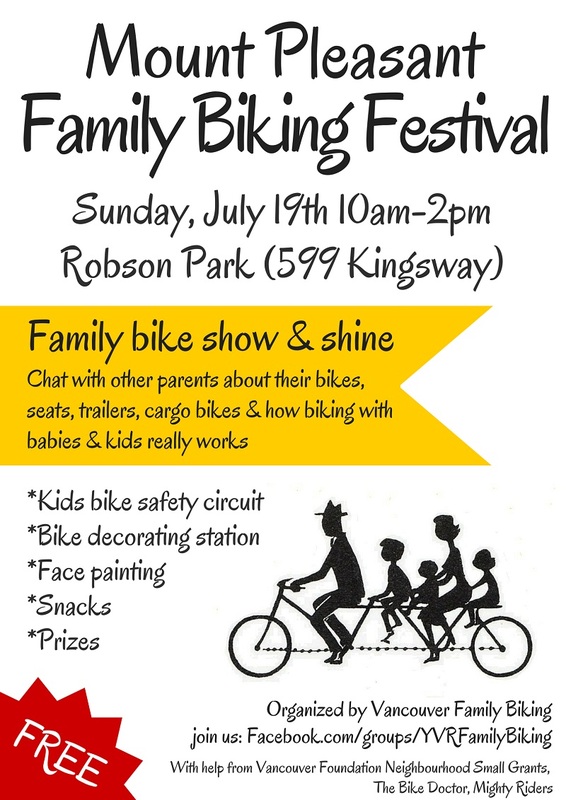 Organizing the Mount Pleasant Family Biking Festival has been a lot of work, but all along the way I've been getting positive feedback & support. It began with the excitement of the Vancouver Foundation grant coordinator about our proposal, & awarding us a Neighbourhood Small Grant. Every time I talk to another parent about the event & what we're trying to do, they get excited about it. I've seen so many retweets & Facebook shares from friends, strangers, businesses & cycling advocacy groups. It's gratifying when people grab extra flyers for their friends. 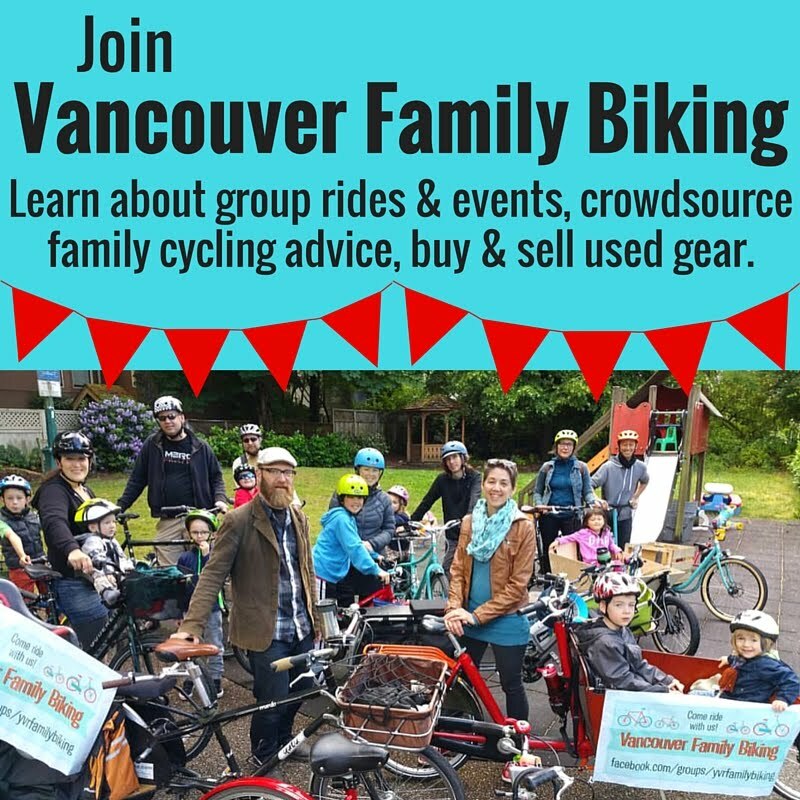 The businesses who are supporting us--The Bike Doctor, Tandem Bike Cafe, & Mighty Riders--have contributed some great prizes & funds, making up over half the budget for the event. Possibly the thing that makes me smile the most is all the friends who have jumped in & offered to help with setup. I couldn't do this without them. There are still a few things left to do before the big event, but I feel really positive about it. 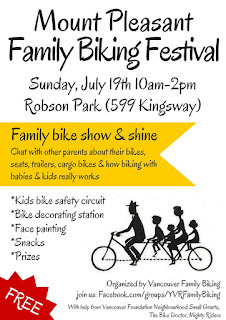 Over a dozen pedal parents are bringing their bikes for the Show & Shine, a few more are helping with setup & doing jobs like facepainting & photography. I've distributed nearly 300 flyers in the past month & Tonya has distributed dozens of posters. We successfully navigated the permit application process for running an event in a city park. This was more complicated than you'd expect because our event doesn't really fit into the boxes that exist already. I think the festival is going to be a success & I can't wait to see it!